Do Guinea Pigs Love Mirrors? When stocking up on accessories for your guinea pig, you may want to include a mirror. It's not to help your cavy fix her hair, but she might find it useful if she gets bored or lonely. 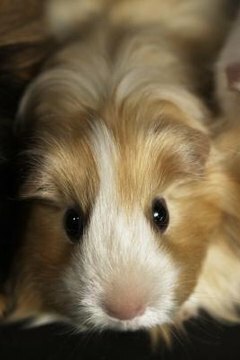 Each guinea pig is different, so not all will respond to a mirror. Those that do, however, may fall in love with their reflections and will enjoy watching the fascinating guinea pig on the other side of the glass. How is a Mirror Beneficial? In the wild, guinea pigs spend their time foraging for food, grooming and snooping around. They also enjoy the company of other guinea pigs, so when you adopt a lone cavy you should be concerned about providing her with toys to keep her busy and prevent loneliness that can result from boredom. Placing a mirror in your guinea pig's habitat might make her think she's not alone, providing a distraction to keep her from growing bored. Your guinea pig doesn't require an ornately framed mirror. All she wants is a reflective surface that she can see her likeness in. If you have a hard time finding mirrors specifically made for cavies in the guinea pig section of the local pet supply store, don't be discouraged. Instead, look in the bird department. You'll find a selection of mirrors of different sizes made for all sorts of pet birds, and one of those will work fine for your guinea pig. Many times birds enjoy mirrors with bells attached, and your cavy should enjoy it, too. Get her one with a bell on the bottom. She may end up spending as much time ringing the bell as she does adoring herself in the mirror. If you've decided to get a mirror for your guinea pig, don't just grab a hand mirror from the drug store and wire it to her cage. An actual mirror made of glass is breakable and could potentially be harmful for your guinea pig. Opt for a mirror made for pets. These are typically made from metal or other pet-safe material and are constructed to withstand the rough handling with which pets sometimes treat their toys. A mirror that spends its time in a guinea pig habitat will need cleaning on a regular basis. You'll be amazed at how quickly the surface becomes coated with layers of food, guinea pig "kisses" and occasional tufts of hair. You can clean your guinea pig's mirror by running it under hot water and using a cloth or plastic scrubber to scrub the surface clean. If you want to disinfect it, use a pet-safe cleaner that is non-toxic and recommended for cavies, such as the cleaners you'll find at pet supply shops. Omlet: How Many Guinea Pigs Make a Home?